An engineering sample for a 12-core, 24-thread AMD Ryzen CPU has been spotted over at userbenchmark. The core-heavy chip is running on the AM4 platform, and from that we can deduce that it’s one of the first engineering samples we’ve seen for AMD’s 3rd Gen Ryzen processors. Running at 3.4GHz base and clocking up to 3.7GHz, this engineering sample runs a fair bit shy of the current Ryzen 7 2700X at 3.7GHz/4.3GHz. We’re not worried, however, it’s still early days for AMD’s 7nm Zen 2 chiplets, with a launch not expected until sometime late May/early June – just in time for the Taipei tech show, Computex. AMD announced 3rd Gen Ryzen over at CES this year. During the keynote, Lisa Su held up a bare AM4 chip, offering up a glimpse of AMD’s Zen 2 chiplet design. That’s one 14nm I/O chip with a single eight-core 7nm chiplet filled to the brim with processing cores. 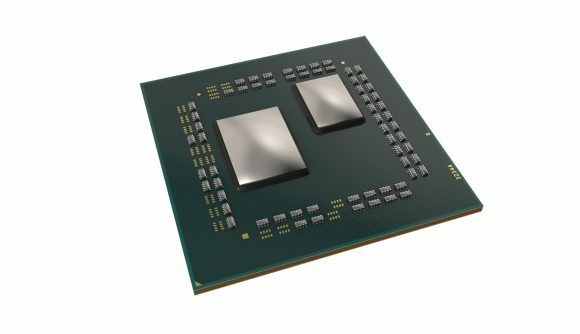 However, there was also enough space for another chiplet to make it onto the AM4 design – likely opening the door to up to 16 cores of processing power. And this latest engineering sample looks to be further confirmation of AMD’s high core-count aspirations. This chip features 12 cores with SMT enabled for 24 threads, the result of two of those chiplets occupying the same package substrate. As for how those two chiplets perform, that’s not quite as certain. Sure, we have results (shout out to TUM_APISAK for their diligent leak-hounding), but we know relatively little about this engineering sample for any valid comparison to be made. The benchmarking system was also running just a single 4GB system memory of 2,666MHz – far from the ideal loadout, that’s for sure. But if we throw caution to the wind and compare Granny Smith’s to the finest Valencia Oranges anyways, this sample manages a single core score of 116pts, just shy of the Ryzen 7 2700X’s score of 120pts. In multi-core testing, the resolutely more core-abundant engineering sample manages a score of 1,741pts, while the eight-core 2700X manages just 1,355pts. None too surprising.